We offer a peaceful and comfortable mountain cabin in the heart of the Klamath Mountains. The setting, nestled among large, ancient, fir trees and majestic hardwoods, is a perfect base camp to explore the surrounding mountains and rivers or just relax and enjoy the peace and quiet. The cabin features a large living room with wood stove, dining table, and two single beds. The kitchen is bright and cheery and fully equipped. The bathroom has a clawfoot tub and shower. The bedroom features a full-size brass bed with closet space. A screened porch with rockers offers a private setting in the clean mountain air. The porch is a suitable place for two cots or sleeping pads. The spacious back yard offers plenty of room for horseshoes, badminton, volleyball, or tents. 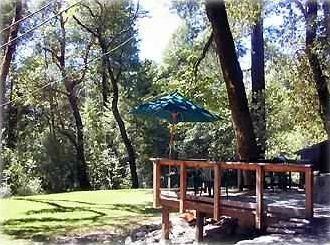 There is a large redwood deck with barbecue/fire pit overlooking the backyard. For those wanting to venture outdoors, our location is an excellent home base to explore the local wild and scenic rivers and the Siskiyou and Marble Mountain Wilderness Areas. Local rafting and kayaking opportunities range from wild Class IV and V runs on the Spring-run Salmon River or less rambunctious Class III and IV runs on the Klamath River. The Siskiyou and Marble Mountain Wilderness Areas of Klamath National Forest offer many miles of maintained trails leading to high peaks, mountain meadows full of wildflowers, and many beautiful lakes. Guided white-water rafting, fishing, hunting, or wilderness pack trips can be arranged with local licensed outfitters. Wildlife, notably elk, black bears, and osprey abound in this wild section of California. Great swimming holes of pure, clean, mountain water can be found nearby at the mouth of Dillon Creek or along many miles of the Salmon River. Nearby Klamath National Forest roads offer mountain biking opportunities. We live 12 miles from the nearest electrical grid, but we offer home water generated power . There is a public phone two miles away on Highway 96 and, if needed, we can provide message service through our home phone. Max is a retired Ecologist for the Forest Service, Nena is a retired Special Needs Aide and a chocolatier and artist. Some of the activities we enjoy are rafting, traveling, gardening, hiking, cooking and art. We are the sole owners of NENA'S CHOCOLATES, a locally owned business. We chose to offer a vacation rental in order to share the beauty of our area with others. Our area is rich with wildlife and we are blessed with clean creeks and rivers. Swimming in nearby Dillon Creek or the Salmon River is a great summer treat. Fishing for steelhead and salmon in the Fall and Winter are popular activities. Often times in Winter and Spring, herds of elk are visible in your back yard or the adjacent homestead meadow. The bathroom has a claw-foot bathtub with shower. The cabin is on 30 acres mostly surrounded by Klamath National Forest lands. We are 12 miles from the nearest electrical grid so we produce our own power with a micro-hydroelectric system. Somes Bar is the nearest town (10 miles) and has a small general store (Salmon RIver Outpost) that is stocked with quality foods, including seasonal produce. The nearest gas station is in Orleans. We are nestled in the mountains at 1600 feet elevation. Dillon Mountain is directly across the Klamath River canyon from the property. Modern propane refrigerator with freezer compartment. Propane stove / oven. Must be hand-lit. French press and drip (cone and filters). Fully stocked with cooking and eating utensils. Rafting and fishing trips available through Klamath River Outfitters (klamathriveroutfitters.com) (530-469-3349). The cabin is on a 3 acre parcel that was divided from the original homestead where the owners live. It was built in the 1930s as a fishing cabin. The parcel has a lawn area, but is predominately a forest of giant Douglas-fir trees and mixed hardwoods. The management goals are to preserve some of the older and larger trees and manage the oaks for acorn production and hazel for basket materials for native Karuk people. We are far from the electrical grid so we produce our own electricity with a micro-hydro power system. Plans are to add solar panels to better balance water use and power needs. Beautiful area and secluded the White Water Rafting was Amazing! The Slammin Salmon did not disappoint! The chocolate was wonderful... Thank you Nena and Max...Loved the dog too! DIRECTIONS: Coming from the north, we are off Hwy 96, approximately 32 miles downriver from Happy Camp. There is a "Wildland Fire Station " sign on the left that is the landmark, turn left up Ti Bar Road after that sign. Coming from the south we are approx. 10 miles north of Somes Bar , (there is a store there) again, look for the Wildland Fire Station sign, turn right after that sign, onto Ti Bar Road. Go approx. 2.3 miles up Ti Bar Road, till you see our address 2117 on a madrone tree on the left.There is also a metal dog marking the driveway. the driveway is on the left, your cabin is there just inside the driveway. We are located in the heart of the very biologically diverse Klamath Mountains. The nearby Wild and Scenic Klamath and Salmon Rivers offer great boating and swimming activities. We are situated between two beautiful Wilderness Areas,The Marble Mountain and Siskiyou Wilderness Areas.